Review: Bridget Jones discovers she is pregnant. She does not know who the father is, which one could it be Mark or Jack’s? 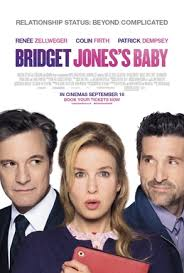 Fifteen years from the original and now we have Bridget Jones’s Baby. This is so much better than Bridget Jones: The Edge of Reason. I was really worried when I first heard that they were doing yet another Bridget Jones film, but I was not at all disappointed by this third (and final?) instalment. This was originally announced in 2009, with the start date eyed for autumn 2010. It was then another six years in development, with various different directors and writers attached. One of the directors who was originally considered was Paul Feig, who has worked on such films as Bridesmaids and Spy. In the end this was very well directed by Sharon Maguire, who directed the first Bridget Jones. I thought Emma Thompson was brilliant. Such a terrific actress. She was only in it for parts of the film but made her character her own. She came across quite formal to start off with but then warmed up. Look out for a walk on part by Celia Imrie. I loved seeing Jim Broadbent as he is one of my favourite actors. He makes it look easy because he is so skilled at what he does. Neil Pearson is always fun to watch and a great presence. I loved seeing the scenes of London as these are a big part of the Bridget Jones story. The script was intelligently written and sometimes very witty. To some extent the film gets better as it goes along. At 2 hours 3 minutes this is quite a long film but I have to say that the time passed really quickly. There were many times where I laughed out loud. Some of the funny gags in it I didn’t quite fully understand, perhaps because the references were a bit dated. Seeing Bridget Jones’ friends again was just wonderful. It was just like seeing friends of your own again. Renee Zellweger was amazing once again and I don’t think there was a scene that she wasn’t in. She carried the film all the way through. It is incredible that she can keep that perfect English accent up you definitely forget that she is actually American. It is not surprising but I did think that Renee Zellweger and Colin Firth did look a lot older. They also look as if they have had a lot of heartache and also a difficult life in all those years that they have lost together. This is a film which deals with quite serious issues such as facing pregnancy alone, and it is genuinely moving at times, but mixed in with lots of hilarious moments. I loved both of the main guys. Neither of them were horrible characters and both of them gave brilliant performances which contrasted really well with each other. I did miss Hugh Grant in this and it was a real shame that he was unavailable. In fact you could say that Hugh Grant’s character, Daniel Cleaver was a big presence in this film. Could there be yet another sequel? In a way the ending of the film seems to leave this as a possibility. We will just have to wait and see! !